The Rio Grande River!! The Rio serves as the boundary between the US and Mexico from here to the Gulf of Mexico. 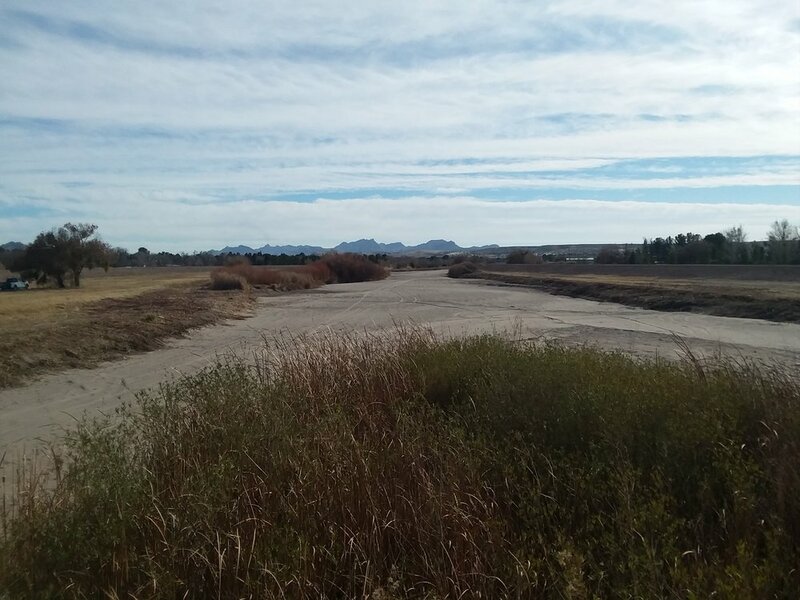 We just had a short distance to walk today to finish the last few miles of New Mexico and cross the river. We went backwards from our hotel going west walking along a busy highway lined with fast food and gas stations. It soon transitioned into a tree covered residential neighborhood that got nicer and nicer as we neared the river. And then we crossed it! We stood on a bridge over the river, but there was no water beneath us only sand. Months ago we contacted a wonderful guy, Colin McDonald who boated the Rio from source to sea. He was a great resource for this trip because he ended up walking hundreds of miles in the riverbed along the border. Exactly what we’ll be doing! He said the river dried up after Elephant Butte Dam further north in New Mexico. Near Presidio, TX it flows again after the confluence of the Rio Conchos. Kind of anticlimactic to get to this pile of sand after working so hard to get here! A couple miles past the river we reached the Texas/New Mexico state line. Another anticlimactic landmark, just a small sign along an otherwise unremarkable stretch of highway. Who cares? We’re so happy to have reached this point!